Welcome to the one of the worst places in all of Africa! 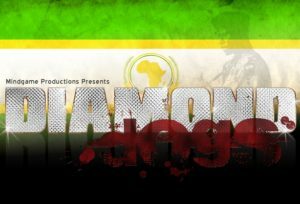 Diamond Dogs 2 takes us back to the dark continent in a swirling morass of rival corporations, hardened mercenaries, and bloodthirsty militia! Nambia is a small country on the west-central coast of Africa encompassing some 1,100 square miles. It’s seen the Portuguese, English and French flags flown over its soil during the era of colonization, achieving independence in 1968. A geographic flyspeck on the continent, it’s been a Petri-dish of tropical disease, a link in the slave trade, a crossroads of tribal wandering and territorial wars, and it’s government has achieved one of the worst human rights records in the world today. Nambia ranks 136th on the UN’s 2014 Human Development Index, it is a source and destination for human trafficking, less than half the population has access to clean drinking water and 20% of children die before reaching the age of five. All in all, Nambia is a tiny, miserable excuse for a country that most would just as soon ignore or forget completely if not for one significant detail… since the mid-1990s it has become one of the largest producers of diamonds and a significant source of uranium. It has the highest Gross National Income per capita of any sub-Saharan African country, however these vast riches are concentrated among a handful of ruling political elite. President Obiang ruled for three decades and survived over a dozen coup attempts. Despite his abysmal record with Human Rights Watch and Amnesty International, Obiang was hailed as a “friend of the United States” and very much a friend of the half-dozen international mining corporations with holdings in Nambia. Two months ago, Obiang’s luck finally ran out in a military coup that left the pieces of dismembered corpse dangling from piano wire at the corners of the presidential palace. While the capital of Montserrado is a whirl of intrigue and infighting as the former coup allies fight for control of the government, the countryside has become a dystopian blood-bath as tribal rivalries resurface and local militias exact revenge on neighbors for offenses both real and imagined. The multi-national corporations have long used private military companies to safeguard their properties in Nambia. In the past month they have tripled this mercenary presence, ostensibly to protect their investments against rampaging militia. With so much international attention focused on the capital, however, some corporations are using this time to conduct military operations against their business rivals. Welcome to one of the darkest places in Africa! Players are expected to comply with uniform rules. Unless stated otherwise in the uniform description, top and bottoms of uniforms are expected to match (e.g., no black shirt worn with multicam pants). Gear may be of any color, uniform guidelines are focused on shirts and pants. All units will have an assigned “arm-band color” players will be required to wear if they fail to meet uniform guidelines. If you don’t want to be wearing a bright blue or yellow arm-band in the woods to properly designate your team affiliation… wear the proper uniform! Tan-Based Uniforms: Multicam, ATACS, Coyote, Desert Digital, etc. A South-African based private military company. Members are primarily recruited from former SADF personnel, with a large number of former East European and Russian military among their ranks. An American-based private military company. Most members are recruited from the US SOCOM community, with numerous British and West European former military members augmented their overseas contracts. While disorganized and undisciplined, Nambian militias are extremely dangerous, psychotically brutal, and usually drugged up on brown-brown (a mixture of cocaine and gunpowder) or from chewing khat leaves. Chaotic African Militia: Civilian clothes, camouflage in strange colors, soccer-team jerseys, American rapper t-shirts from the ‘90s, etc.